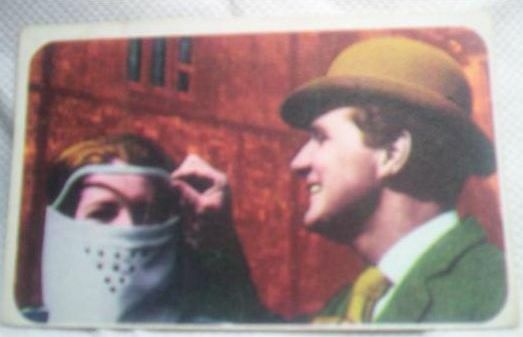 I keep for many years the photo of rare Avengers card, which seen on one of the European online auctions. Maybe someone knows something about it. On moment, I still think about Spain? This largest country produced some painted cards in 1960s. This is a scene from the episode where Emma dances before a sultan in order to infiltrate his harem and find a killer. Haha, you might think so with the weird head gear but it's not. It's the tag scene from "The Bird who Knew too Much" - Mrs Peel has changed into "something suitable for open air motoring". Filmed at Beaulieu Motor Museum, directed by Roy Rossotti (who directed all the Beaulieu scenes). Quite why the card is tinted in the wrong colours is beyond me. Found back side of this card. I still hoped that in the end it would be a postcard, but no. Great rare card. Nice photo from The bird who knew too much. Must have been a b/w shot that they tinted, but still a very rare card. I've got all the British sets, but I've never seen Spanish ones before. I'll have to keep searching ebay! Wonderful choice of image, I noticed that the Spanish manufacturers love to colorize b/w images for their cards. This is the only card in Spanish, which at the moment I can not determine the part of what it is. I hope to check out thrift type shops etc and see if anything turns up. 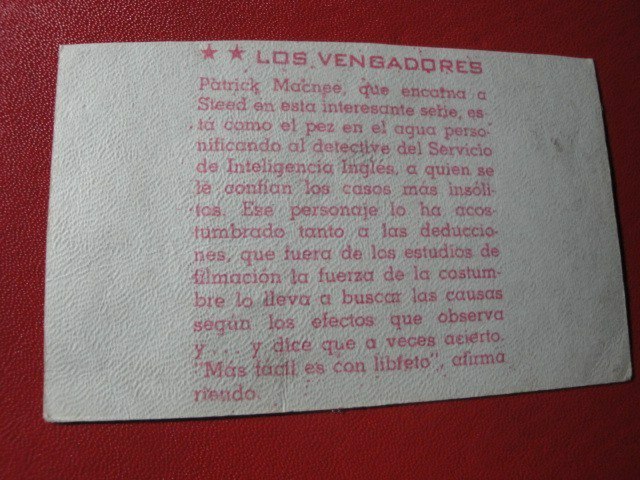 It became known that this card is part for the supplement to the Argentine album "Reino Salvaje" (1970s).